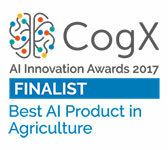 Hortau was recently named a CogX Award finalist in the Best Artificial Intelligence Product in Agriculture category. The awards were handed out at last month’s CogX Innovation Exchange and Annual Awards in London, an event that brought together more than 350 of the world’s leading Artificial Intelligence experts from industry, academia and government. Hortau was a finalist in the Best AI Product in Agriculture category along with Prospera (winner) and Abundant Robotics. Other winners from the CogX AI Innovation Awards included Tesla (Best Overall Product), DeepMind (Best Overall Innovation) and UiPath (Outstanding Achievement). Learn more about the CogX Awards at https://cogx.co.